The Four Presidents Distinguished Public Service Award was created by Alfred Davis to honor the four presidents he worked with that held public service as a priority during their time at RIT: Mark Ellingson, Paul Miller, M. Richard Rose and Albert Simone. A new streamlined nomination process for the Four Presidents Distinguished Public Service Award continues to make it easier for candidates to apply. The award, created by Alfred Davis, recognizes staff or faculty member’s public service. 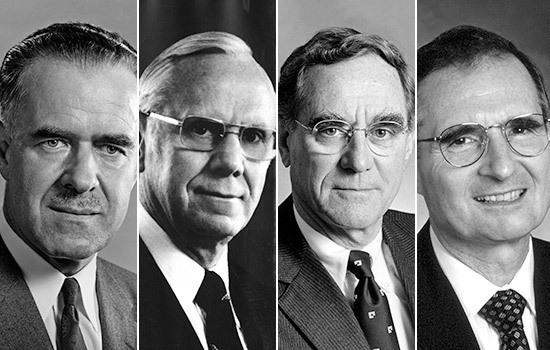 It was established to honor four former RIT presidents who Davis felt placed great value on public service during their time serving RIT—Mark Ellingson, Paul Miller, M. Richard Rose and Albert Simone. To nominate someone for this award, submit the person’s name, position, contact information and a brief explanation as to why the individual qualifies for the award to the online nomination form. Once committee members review the initial application, they will reach out to the nominee for supporting documentation about their service work. The committee is accepting nominations until Nov. 29. The award will be presented on April 3. Cindee Gray, assistant vice president of the RIT-Rochester Regional Health Alliance, received this award in 2016. Now she is the chair of the committee selecting the award’s annual recipient. “As a university, we have such a breadth of talent and experience among our faculty and staff to share with our community. It is truly awe-inspiring to learn about those who share their passions and commitment to service and leadership for those in need,” said Gray. To nominate a faculty or staff member, go to https://www.rit.edu/gcr/four-presidents-distinguished-public-service-award-nomination-form.